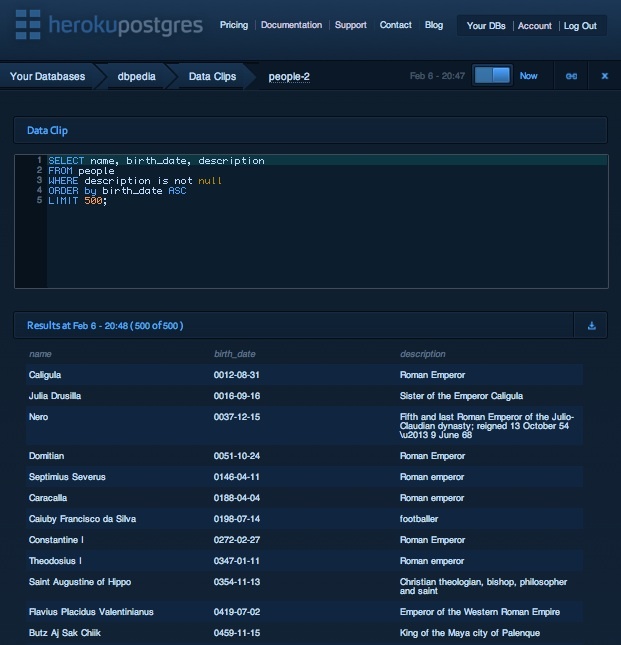 Cloud Platform-as-a-Service provider Heroku (s crm)has added a new feature to its PostgreSQL database service that lets users share the results of an SQL query simply by sending a URL. The feature, called Data Clips, is in beta mode and is the first new feature of likely many since the company launched Heroku Postgres in November. According to Heroku Postgres Product Manager Matthew Soldo, the new feature came about because Heroku employees often found themselves sharing SQL data in less-than-ideal manners. One popular technique, he told me, was to paste the results of a database query into Gist and share as a text file. But that process involved extraneous steps and, often, the data got outdated rather quickly. With Data Clips, the URL takes recipients to a web page displaying the results as they existed when the query ran, but there’s also a toggle switch in the upper-right corner that lets users switch to a real-time view of results for the same query. The data can also be downloaded as either JSON, CSV, XML or Microsoft (s msft) Excel files. Sticking with the characteristics that made Heroku so popular among developers in the first place — and that helped spur what some have dubbed the “NoOps” movement among PaaS providers– Data Clips is a relatively simple and intuituve tool. According to Soldo, displaying the data and generating the URL were relatively easy, but getting the user experience just right actually took a fair amount of time. It’s not earth-shattering, but Soldo is right that Data Clips is certainly useful. As data becomes more important among all types of organizations and users, sharing what you’ve found with others becomes a great method for collaboration or for just disseminating information. EMC (s emc) Greenplum does it for big data, Heroku does it for Postgres data, and many more methods for simplifying data-sharing are likely on the horizon. I found myself. My purpose. I found myself online. In the process Google found me to.